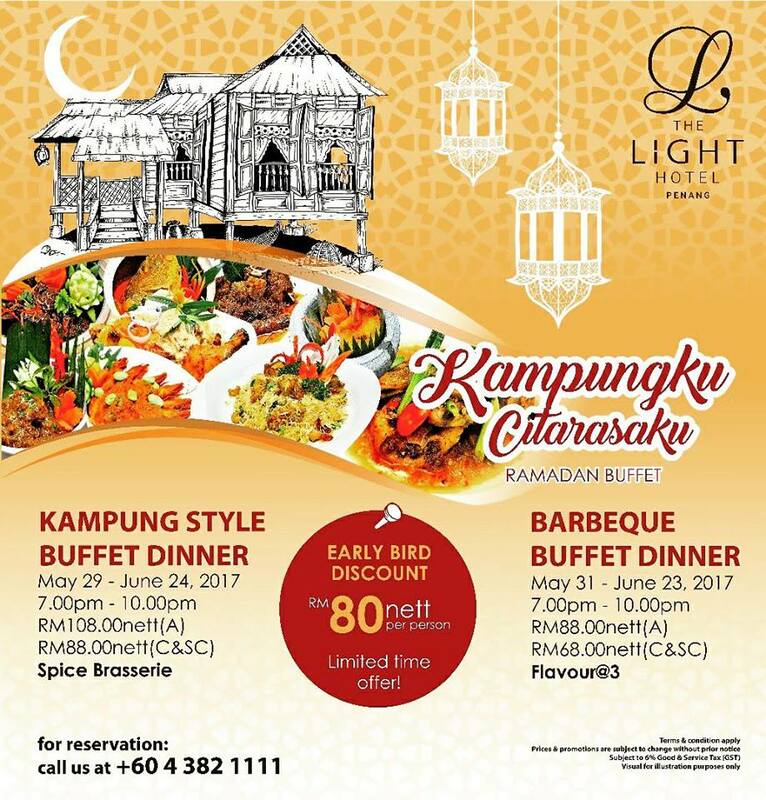 The Light Hotel at Seberang Jaya hosts its Ramadan buffet dinner preview today. In the spirit of the upcoming festive season, the hotel's lobby is decorated in Hari Raya ornaments. Beneath the fancy chandeliers is a nipa-thatched Malay house with glittering lighting. Unlike the previous year, today's preview event is held at Spice Brasserie the hotel's main coffee house next to the lobby. This year's theme is "Kampungku Citarasaku". This month-long meal promotion features over 150 dishes with 5 menus on daily rotation. Staffing the kitchen is a team of experienced chefs with diverse culinary background. Kurma (pitted palm date) is essential in any iftar meal. As per tradition, Muslims break fast by taking dates before Maghrib prayers. The buffet table presents dates from various countries such as Saudi Arabia and Tunisia. Traditional Malay appetizers often revolve around ulam (raw vegetables). 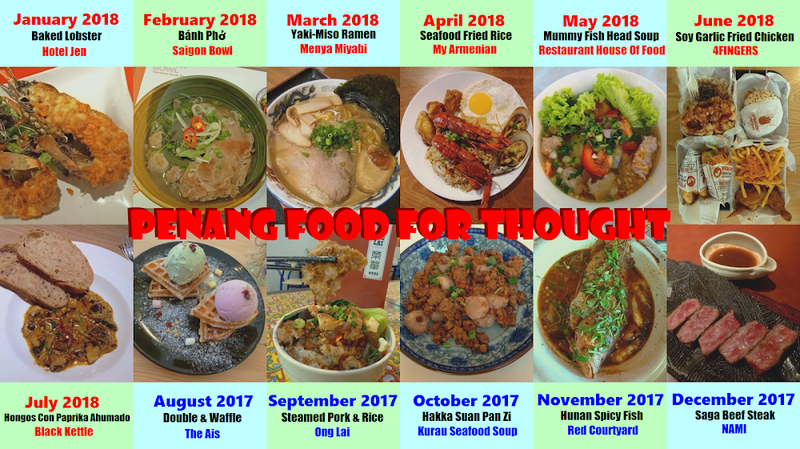 Due to lack of flavor, ulam is often eaten with condiments such as air asam (tamarind sauce), budu (fish sauce), cincalok (fermented shrimp) and sambal belacan (chili shrimp paste). In addition, ikan masin (salted fish) and telur masin (salted egg) are also popular during monsoon season when fresh food is in short supply. Kerabu (salad) is quite popular within the rural Malay community. Today's kerabu line-up includes Kerabu Betik Muda (Unripe Papaya Salad), Kerabu Udang & Tanghoon (Shrimp & Noodle Salad) and Kerabu Telur Ala Thai (Thai-Style Egg Salad). Acar Jelatah (Pickled Fruit Salad) is also made available. Lemang Pulut Hitam (black glutinous rice cooked in hollowed bamboo stems) is customarily eaten towards the end of Ramadan. Other rice items include Ketupat Pulut (glutinous rice dumpling wrapped in palm leaves) and Pulut Kuning Kukus (steamed glutinous rice with turmeric). Kari Ayam (Chicken Curry) goes well with rice. Originating in Kelantan, Serunding is very similar to Chinese's rousong (肉松). Popular choices of meat are beef, chicken and fish. The meat is seasoned with spices, and then cooked gently until it becomes reduced to flossy matter. Serunding is often eaten with lemang and ketupat. Kambing Golek (Roast Lamb) is one of the main highlights this evening. The lamb is marinated for a day using special Middle-Eastern spice mix based on cumin and yogurt. There are four types of sauces to go with lamb: percik, black pepper, barbecue and mint. Percik sauce is by far my favorite one. I enjoy the appetizing juiciness that the lamb presents. Sup Gearbox (Beef Bone Soup) is stewed from chopped segments of the cattle's femur. The soup is named so because the femur (especially near joints) resembles a gear stick. Stewed for more than 7 hours, the soup is saturated with rich flavors of beef. Nevertheless, I feel that the main appeal is actually the creamy marrow at the center of bones. Gulai Kawah Ekor Lembu Dengan Rebung (Oxtail & Bamboo Shoot Curry) is a savory curry dish that is served in a kawah. Kawah is a large wok that is typically used to cook large quantities of food at once. Best enjoyed with rice, this spicy dish contains chunks of oxtail, bamboo shoots, shiitake mushrooms and oyster mushrooms. The overall aroma is dominated by bamboo shoots, which may not everyone's cup of tea. Shawarma Ayam is the most well-known Levantine street food outside the Middle East. Chicken is cooked on a vertical rotisserie with heating element at the back. As the outer layer of chicken becomes cooked, thin slices are shaved off using a sharp knife. Chicken slices are mixed with condiments like mayonnaise and onions, and then stuffed into pita bread. There is an action counter next to the open kitchen, serving Indian-Muslim favorites such as Murtabak Ayam, Roti Jala and Roti Canai. The appeal of these comfort foods is highly dependent on temperature, so I urge you to request for fresh ones from the griddle. Also served at the action counter are Char Koay Teow (炒粿条) and Mee Udang Hokkien (福建虾面). Nasi Hujan Panas uses basmati rice which is lighter on the mouth than jasmine rice. The rice is called "hujan" (rain) because the grains are dyed in several colors. Besides spices and ghee, Nasi Hujan Panas is also served with cashew nuts, raisins, fried onion and cabbage. Other rice dishes are Nasi Beriani Kambing (Mutton Biryani) and Bubur Lambuk. Rendang Daging Lembu (Beef Curry) is originally a Minangkabau delicacy but is now ubiquitous in Malay cuisine. This meat dish relies on a clever blend of spices to saturate beef with rich flavors. Through slow cooking, the original liquid is gradually reduced until what remains is tender beef chunks coated in savory spice mix. Ayam Percik (Roasted Chicken) is one of the most popular Malay cooking styles for poultry. This chicken dish hails from the east coast of West Malaysia, but there are now nationwide chain restaurants that specialize in Ayam Percik. Sotong Masak Lemak Tempoyak (Squid In Coconut Milk & Fermented Durians) is not something to be trifled with. The yellow gravy is based on tempoyak a type of pungent paste made from fermented durian. I feel that durian is more pronounced in terms of aroma, but when it comes to taste, coconut milk dominates. Ikan Goreng Berlada (Spicy Fried Fish) is another dish to delight one's taste buds. Each piece of fish fillet is coated with tantalizing spice mix. Meanwhile, curry leaves and dried chili peppers provide aromatic appeal. Gulai Udang Nenas (Shrimp & Pineapple Curry) uses moderate-size shrimps and tangy pineapples. The gravy is made creamy using coconut milk. As you may have noticed, liberal use of coconut milk is a common theme in Malay cooking. Asam Pedas Ikan Tenggiri (Mackerel In Spicy Tamarind Sauce) carries sharp spiciness as well as mouthwatering sourness of tamarind. Mackerel is often used in this dish because it is sufficiently firm and is a relatively inexpensive fish. Sambal Telur Ikan (Fish Roe In Chili Sauce) is an exquisite delicacy. It is not easy to find this dish nowadays, and far fewer people know how to appreciate it. I love the unique texture presented by the roe. A section of the buffet is dedicated to Indian cuisine. Indian cuisine is renowned worldwide for its liberal use of spices. Nearly every Indian dish involves spices in one way or another. Recipes from the subcontinent today are Sotong Masak Varuval (Spiced Squid), Ayam Masak Vindaloo (Goan Curry Chicken) and Masala Kubis Bunga (Spiced Cauliflower). Seafood on ice comprises of snow crabs, scallops, mussels and shrimps. Condiments to go with chilled seafood are garlic aioli, tartar sauce and Thousand Island dressing. For Udang Kara Berkeju (Lobster Thermidor), lobster meat is mixed with egg and returned to its shell. Covered with a layer of cheese, the lobster is then baked. There are three types of pizzas today: Italian (with cheese), Indian (with masala spices) and Arabian (with olives). Also presented are deep-fried potato wedges. 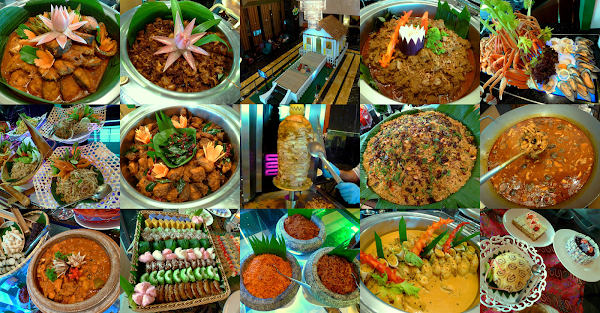 The Light Hotel's Ramadan buffet dinner also covers a wide assortment of traditional Malay kuih. Presented here are popular ones that you often see in Ramadan bazaars, namely Kuih Koci, Kuih Akok, Kuih Kosui, Kuih Lompang, Onde-Onde, Puteri Ayu, Seri Muka and Huat Kueh. Rempah Udang is a banana leaf-wrapped kuih which is made from glutinous rice and shrimp paste. Meanwhile, Kuih Tako is a type of coconut pudding with bits of crunchy water chestnuts. All in all, there are more than a dozen types of kuih of baked and fried varieties. Besides local kuih, the desserts section also offers a reasonable number of Western pastries to satisfy your sugar cravings. Examples are cakes, apple crumble, mousse, puddings, custards and jellies. One of the main highlights today is Bubur Durian, a warm dessert which is quite similar to Pengat Pisang. But instead of bananas, this sweet treat is prepared from durians. I enjoy the creamy consistency of Bubur Durian. Also present is the soothing aroma and fruity sweetness which the king of fruits is renowned for. Sago pearls are also included to enhance mouthfeel. At the drinks counter, I am most impressed with how Teh Tarik is prepared. Brewed from black tea, condensed milk and evaporated milk, this hot drink is "pulled" between metal containers in order to make it frothy. Other drinks available this evening are nutmeg juice, lime juice, cincau, bandung, chrysanthemum tea, soya bean and rose syrup. The Light Hotel's Kampung-Style Buffet Dinner is available from 29 May to 24 June 2017 from 7:00pm to 10:00pm. 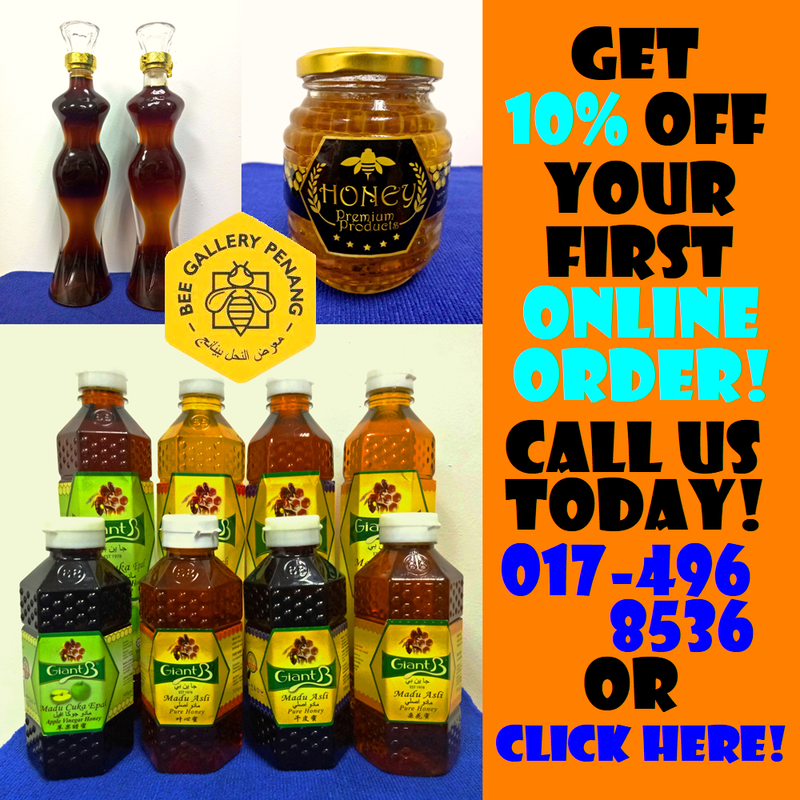 The price is RM108.00 net for adults, RM88.00 net for children and senior citizens. For a limited time, early bird adult vouchers are offered at RM80.00 net. There is also a separate Barbecue Buffet Dinner at Flavour@3 that is priced at RM88.00 and RM68.00 respectively.